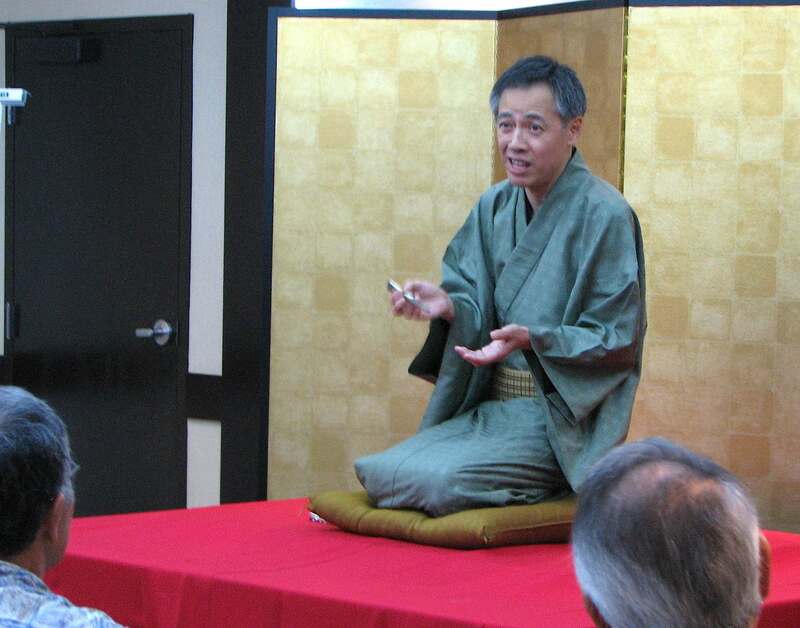 The Canary English Rakugo Company presented traditional Japanese comic storytelling at the Miyako Hotel in Little Tokyo on Aug. 15, the first day of the Nisei Week Japanese Festival. 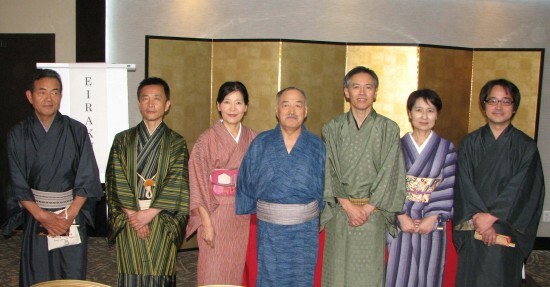 Rakugo, which has a 400-year history, features a lone storyteller dressed in a kimono. He or she kneels on a cushion and uses only a fan and hand towel for props. The story often involves playing multiple characters. The introduction was given by Kanariya Eiraku (Tatsuya Sudo), whose stage name means “English is fun.” He started English rakugo classes in Tokyo in 2007. Eiraku performed “Time Noodles,” in which a man goes to a noodle stand and uses a trick to cheat the proprietor when paying the bill. Another man watches and tries to do the same thing the next day, with unfortunate results. Yuntaku — “A God of Death,” in which a poor man is accusing of earning too little money by his wife and tries to kill himself. He meets the God of Death and learns how to make money from him. Shichimi — “The Raccoon Dog that Returned the Favor,” in which a man helps a tanuki being bullied by mischievous kids. When the tanuki comes to the man’s house to return the favor, the man asks the tanuki, which has magical powers, to turn into money to repay a debt. Edamame — “Shiba Beach,” in which a fishmonger who does not work very hard picks up a large amount of money at Shiba Beach and decides not to work, much to the embarrassment of his wife. Tanekichi — “The Zoo,” in which a man who often changes jobs because of laziness is recommended to work at a zoo. He accepts the offer and starts to work at the zoo, then faces something unexpected. Kappa — “Long-Tempered vs. Short-Tempered,” in which two men of different temperaments often fight but are still good friends. Kosei — “A Heron Hunter,” in which a hunter catches a lot of herons (sagi) when they are asleep. When they wake up, they decide to fly into the sky. One of the scheduled storytellers, Ichirin, was unable to attend. The troupe did two shows the following day at Opus Music in Torrance. In the Bay Area, they appeared at the San Mateo Japanese American Community Center on Aug. 12 and the Japanese Cultural and Community Center of Northern California in San Francisco on Aug. 13.